The Ponte di Legno area unites two important natural reserves, the Stelvio and Adamello Parks. Thanks to the safeguard granted by these two institutions, together with the sensibility of the local communities, the valleys around town still offer wonderful vistas, and a safe haven for the alpine fauna. This alpine crossing offers evocative views all year round; divided between Brescia and Sondrio in the area of the Stelvio National Park, it’s also the birthplace of the PDO cheese Silter in Sant’Apollonia. Cycle-lovers must have heard of it; the “Giro d’Italia” often proceeds on its hairpin turns, and in the summer the pass become a required stop for all those who wish to experience the same challenges of professional cyclists. With its sun-kissed meadows and the crisp mountain air to greet you, the mount Tonale is a wonderful view in the Summer months; it’s during the Winter, however, that it reveals its true aspect: his fields become white-powdered slopes, populated by eager skiers from all over Europe and beyond. One of the first national parks to be established in Italy, the Stelvio Park together with the surrounding parks, both Italian and Swiss, form one of the largest natural preserves in the Alps, a veritable treasure of biodiversity. 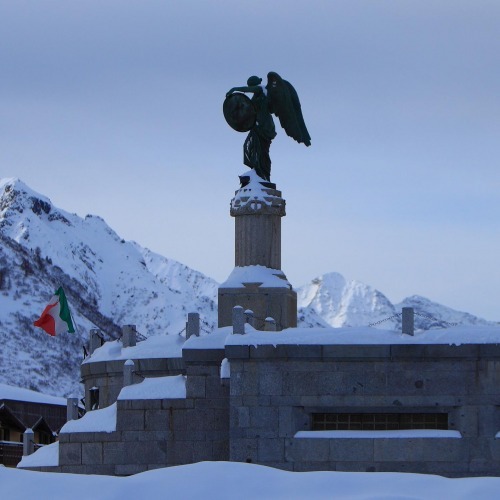 For the excursionists, the park is accessible from the Camonica Valley through the Val Grande and Val delle Messi/Gavia Pass. Located between the alpine passes of Tonale and Crocedomini, the Adamello Regional Park is the continuation in the Lombardy area of the Adamello-Brenta Park of Trentino; a treasure for tourism and biodiversity, as proved by the sightings of bears, recently reintroduced. Forgotten for ages and discovered only at the beginning of last century, the hidden treasure of Valle Camonica’s rock carvings waits for you in Capo di Ponte; discover the first UNESCO World Heritage Site in Italy wandering through the woods between millennia-old carvings that offer a fascinating insight on the ancient Camunni’s way of life.